What Does The Skin Classic Treat? The Skin Classic is an award-winning laser alternative treatment for common skin irregularities such as broken capillaries, cherry angiomas, keratosis, skin tags, hyper-pigmentation, milia, sebaceous hyperplasia, and acne. Broken capillaries are small dilated blood vessels near the surface of the skin or mucus membranes. They can develop anywhere on the body but are commonly seen on the face around the nose, cheeks, chin, and chest. They can be caused by environmental damage such as sun or cold exposure and may increase as we age. Trauma to the skin such a contusions and surgical procedures are also a factor as well as radiation therapy. Cherry Angiomas are small clusters of capillaries at the surface of the skin that form a small round dome, orpapule, which is often flat topped. The color typically ranges from bright red to purple. When they first begin to appear, they are almost flat and appear as small red dots. These dots can grow over time up to a centimeter or more in some cases. Larger cherry angiomas may be thick and raised. These are found in various areas of the face and body and are typically caused by aging, pregnancy, genetics, and excessive sun exposure. Sebaceous Hyperplasia is a disorder of the oil glands and is a common, benign condition most commonly found in adults of middle age or older. These lesions can be single or multiple and appear as a yellow, soft, small papule on the face. They are round and the oil surrounds the pore giving it a "donut-like" appearance. Typically these occur on the nose, cheeks, and forehead. Occasionally, sebaceous hyperplasia appear on the chest or other parts of the body as well. Brown Spots, or Lentigo, are small pigmented spots that occur on the skin and have a clearly defined edge, surrounded by skin that appears normal. These are benign and restricted to the cell layer directly above the deepest membrane of the epidermis, which is where the melanocytes that make up these spots normally reside. Unlike freckles, these will stay stable in their color regardless of sunlight exposure. The most common, benign, sun induced lesion is a solar lentigo (actinic lentigo, senile lentigo, sun spot, liver spot). They occur in sun exposed areas appearing on the face, arms, tops of hands, and chest. The spots are typically smaller than 5mm in diameter and can be flat or depressed and may be split by fine wrinkles. The lesions are usually brown in color and may range from yellow-tan to black. Older lesions are often darker brown or black and can slowly increase in number and in size. It is most commonly found in individuals aged 30-50 years old. Increased exposure to sun and artificial sources of UV light can cause these to appear at an even younger age. A seborrheic keratosis is a non-cancerous (benign) skin. tumor that originates from cells in the outer layer of the epidermis, also known as keratinocytes. Like liver spots, seborrheic keratoses are seen more often as people age. These lesions can be slightly elavated and have a waxy or scaly appearance like a scab from a wound. They can appear round of oval, ranging from very small to more than one inch in size. These growths can appear in various colors, ranging from light tan to black, and have been often described as having a "pasted on" appearance. Seborrheic keratoses are commonly found on the face, chest, shoulders, and back. Although typically painless, they can become irritated from clothing or jewelry that causes friction. While seborrheic keratosis is non-cancerous, basal cell carcinoma can sometimes be found in the same location and sometimes can progress into basal cell carcinoma. A skin tag is a small benign tumor that primarily forms in areas where the skin creases, such as the neck, armpit, and groin. Sometimes they may also appear on the eyelids or other areas of the face. These are harmless and typically painless, and do not grow or change over time. 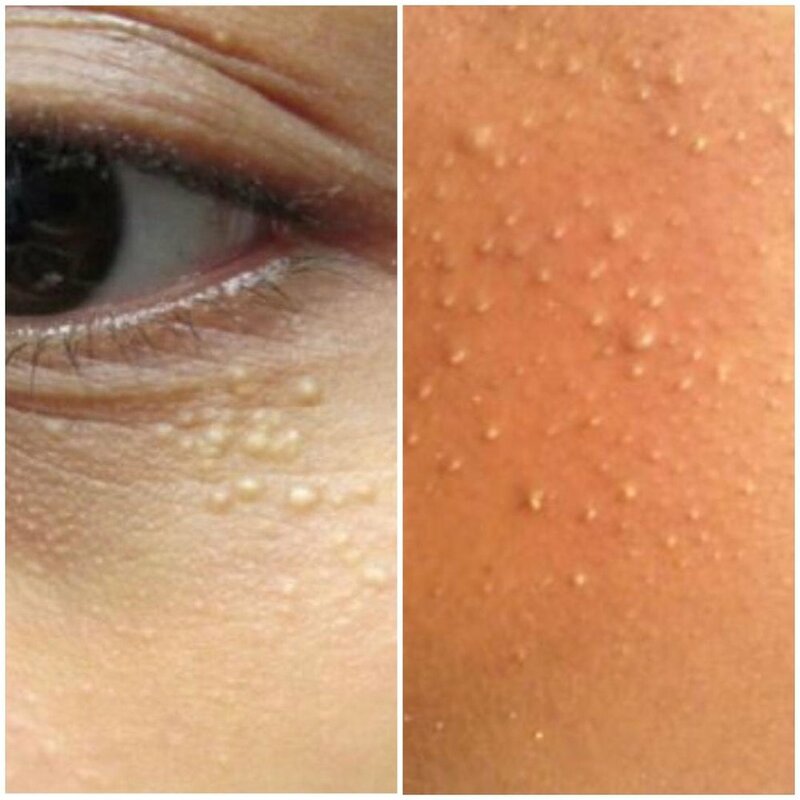 Skin tags can be large, sometimes up to a half inch long, but are most commonly about the size of a grain of rice. The surface can range from smooth to rough. They can become irritated by shaving, clothing, or jewelry. Common causes are weight gain, genetic, diabetes, and pregnancy. They are also more common in women than men. 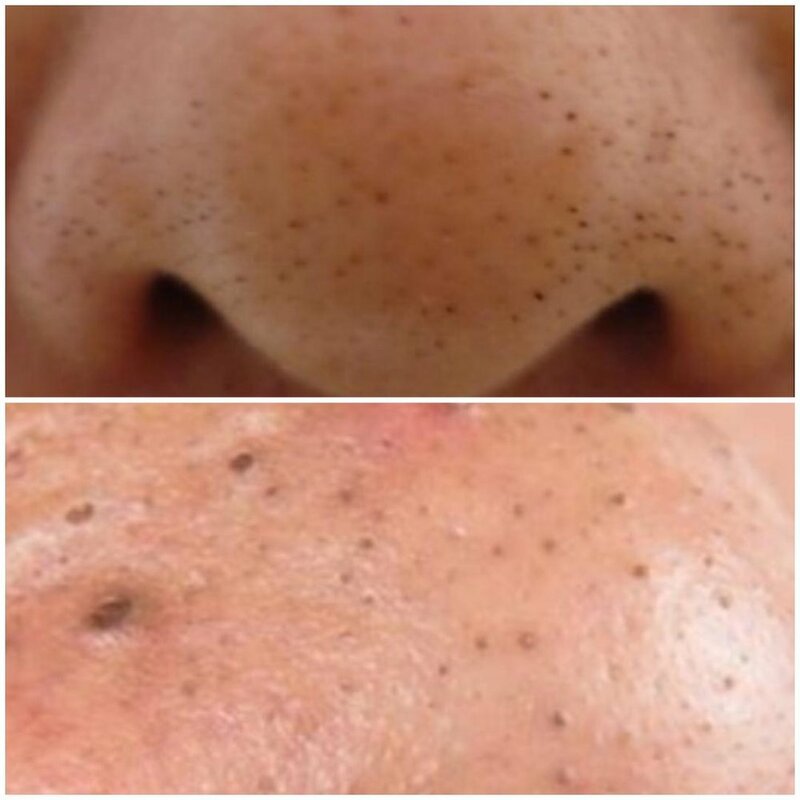 Blackheads, or comedones, are a black colored bump on the skin. A blackhead is a type of acne called vulgarisms. These are caused by excess oil that has accumulated in the sebaceous gland's duct. The substance found in these bumps typically consists mostly of keratin and sebum. Clogged Hair follicles (where blackheads tend to occur) reflect light irregularly which produces a black hue. For this reason, the contents of the blackhead may not look black when extracted, but more so a yellow or brown color. Also, the open follicle begins to oxidize which contributes to the black appearance as well. A milium, plural milia, is a keratin filled cyst that can appear just under the epidermis. Milia are very common in newborn babies, but can appear on people of all ages. They are most commonly found around the nose and eye. In children, milia disappear easily, on their own. However, in adults they may require removal by skin care professional. Acne Vulgaris, or cystic acne, is a common skin disease, characterized by areas of the skin with blackheads, whiteheads, papule, pimples, and cysts usually accompanied by scarring. Acne is most common on the face, back, and chest and can sometimes be inflammatory. Acne is most common during adolescence but is also often found in young adults, or even adults forty and over. Acne develops from blockages in the hair follicles. Hormones play a huge role in breakouts as well as genetic.